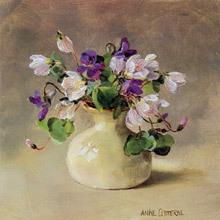 Anne Cotterill was able to combine her extraordinary talent for painting with her delight in flowers of all descriptions. 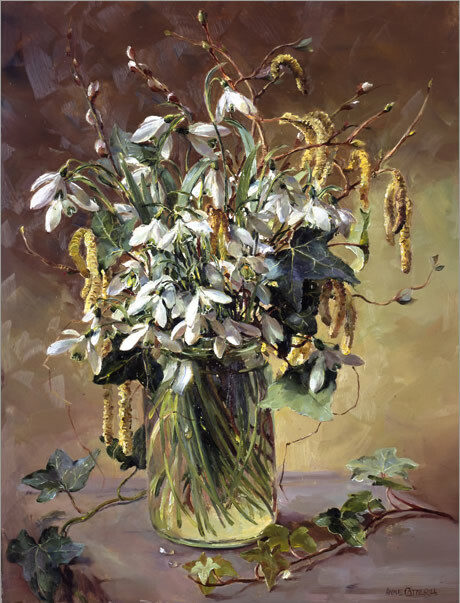 The resulting paintings are some of the most interesting, delicate yet lively floral studies of contemporary times. 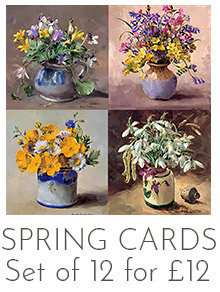 Our collection of flower greetings cards and Limited Edition prints from these paintings depict wildflowers of all descriptions; primroses, violets, snowdrops, bluebells, wood anemones etc. 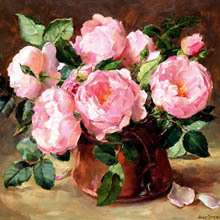 Anne Cotterill also took great pleasure from the garden flowers that she grew at her Somerset home and her paint brush delighted in daffodils, sweet peas, roses, lily of the valley and many, many more. 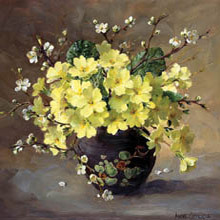 We currently produce over 150 flower cards from her oil paintings, all of which may be ordered via this website. In many instances, the cards are reproduced at the exact size of the original paintings. In the range there are currently five sizes of individually wrapped cards, with the smallest also available in note card packs. 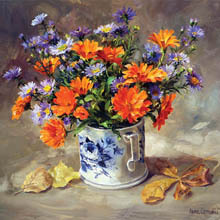 All the cards and prints may also be viewed at our office and gallery, Mill House Fine Art Publishing, The Bellflower Gallery, Market Place, Colyton, Devon, EX24 6JS. Tel 01297 553100 for opening times. We also produce a mail order catalogue for our customers who prefer not to order online. Please email [email protected] or telephone 01297 553100 if you would like more information.